Canned sardines are a quick, convenient option when hunger strikes. Low in calories and high in protein, they fit into any diet. You can even enjoy them late at night without having to worry about your waistline. Eat them straight from the can, add them to salads or try your hand at more complex recipes, such as sardine chutney, sardine sriracha or fish cakes. Rich in protein, omega-3s and minerals, canned sardines are a healthy addition to most diets. Aim for two servings a week to reap the benefits. The global sardine market is expected to reach a total volume of 3.6 million tons by 2023. Several species are available in stores, including Sardina Pilchardus, Sardinella Gibbosa and Sardinella longiceps. Canned sardines are more popular among customers than fresh and frozen varieties. These tiny fish are washed, prepared either by steam-cooking or deep-frying and dried before being canned. Most manufacturers pack them in soy or olive oil, as well as in tomato or mustard sauce. Quality canned sardines are eviscerated and have their heads and gills discarded. According to the FDA, these fish are low in mercury. Anchovies, clams, herring, oysters, salmon and cod fall into the same category. King mackerel, tilefish, bigeye tuna and shark, by comparison, boast large amounts of mercury and may pose health risks. Pregnant women and children can safely eat sardines up to three times a week. Canned sardines are also a good source of vitamin A, vitamin E, vitamin K, copper, zinc and magnesium. Compared to most types of fish and meat, they're higher in cobalamin or vitamin B12, a water-soluble nutrient that supports DNA synthesis and red blood cell formation. According to the National Institutes of Health, up to 15 percent of Americans are deficient in this vitamin. A diet low in cobalamin can lead to anemia, fatigue, depression, memory problems, neurological changes, dementia and more. A 2016 review conducted at Victoria University in Melbourne, Australia has linked vitamin B12 deficiency to a fivefold increase in the rate of brain atrophy. It may contribute to cognitive decline, psychosis and severe depressive symptoms. In clinical trials, vitamin B12 supplements have been shown to relieve depression and boost cognitive function. Canned sardines provide a whopping 137 percent of the daily recommended intake of vitamin B12. Therefore, they may help protect against anemia and depression when consumed as part of a balanced diet. These tiny fish are also loaded with omega-3s and may improve cardiovascular health. In 2018, The BMJ published a study assessing the benefits of omega-3 fatty acids for older adults. These nutrients have been linked to an 18 percent lower risk of unhealthy aging. Omega-3s may also prevent and improve mood disorders, enhance cognitive function and ward off depression. Sardines also contain large doses of calcium and vitamin D. These nutrients work synergistically, keeping your bones strong. As American Bone Health points out, vitamin D improves the body's ability to absorb calcium. However, dietary supplements seem to be less effective compared to real food. Researchers recommend eating foods rich in these nutrients rather than taking them in pill form — unless you're deficient in vitamin D.
Insulin resistance is a major contributing factor to diabetes, metabolic syndrome, dyslipidemia, inflammation and impaired endothelial function. If left unaddressed, it may cause Type 2 diabetes within 10 to 15 years. Dietary and lifestyle changes, such as losing weight and cutting back on carbs, may improve insulin response and prevent complications. A 2015 study published in Molecular Medicine Reports found that sardine protein may prevent and reverse insulin resistance in rats. Animals on a sardine diet experienced greater improvements compared to those fed with casein. Fish protein also appears to be more filling than chicken and beef protein. These potential health benefits may be due to the heart-healthy fats and protein in sardines. According to a 2018 review featured in the journal Nutrients, omega-3s fight inflammation and improve energy metabolism, which in turn, may help protect against insulin resistance. Protein slows sugar absorption into the bloodstream, which further helps improve insulin response. 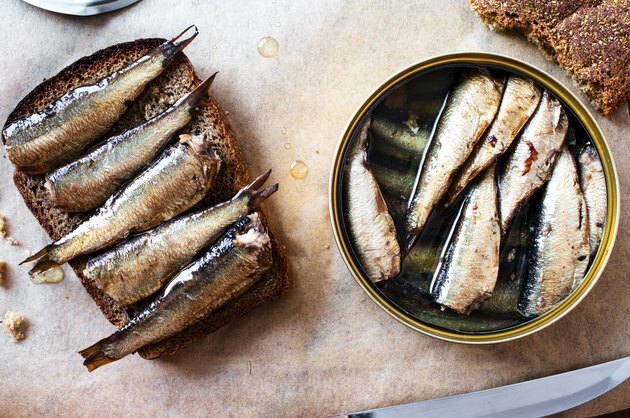 These are just a few of the many benefits of sardines. When consumed in moderation, this fish is unlikely to adversely affect your health. Just make sure you don't go overboard. According to the Office of Dietary Supplements, omega-3 supplements and fish oil may have blood-thinning effects, cause minor digestive problems or decrease your immune response. Therefore, they may not be safe for people with blood clotting disorders. However, these findings are related to dietary supplements, which contain higher doses of omega-3 fatty acids than sardines and fish in general. Read more: Is Too Much Omega-3 Bad for You? Beware that most canned foods, including sardines, may contain Bisphenol A (BPA). This chemical mimics estrogen and may increase the risk of ovarian, breast and prostate cancers. It can also affect male reproductive function, brain development and cardiovascular health. More research is needed to confirm its potential side effects. Unless you're allergic to fish, you can safely eat sardines and reap their health benefits. To stay safe, opt for BPA-free cans. Ideally, choose wild-caught sardines over farm-raised varieties. Farmed fish often contain antibiotics, dioxins, pesticides and other potentially harmful chemicals. Additionally, farmed fish are usually higher in omega-6s and lower in omega-3s. If you're on a diet, water-packed canned sardines are a great choice. Depending on the brand, this variety can have as little as 41 calories per serving. To get more omega-3s, opt for sardines packed in extra virgin olive oil. Those prepared in tomato sauce are usually higher in sugar and carbs and may contain artificial flavors. Despite their small size, these mighty fish pack a hefty nutritional punch. Mix them with pasta or risotto, pair them with avocado, pile a couple on toast or use them as a substitute for anchovies in salad dressings and sauces. Keep a few cans in your car to get your daily dose of protein on the go. Medical News Today: Can Fish Oils and Omega-3 Oils Benefit Our Health? SCD Lifestyle: Farmed vs. Wild Fish: Which Is Better for a Healthy Gut?